No to High Speed 2: Were the standards a waste of money? Were the standards a waste of money? Toddington - Gloucester and Warwickshire Railway, originally uploaded by Elmar Eye. An article in this month's Steam Railway discusses the standard fleet of British Railways steam locomotives built to new designs between 1951 and 1960. There were 999 of them, and all were out of service by 1968, so they were not good value for money. Were British Railways' engineers to blame? The story is long forgotten, but, as the article reminds us, the British Transport Commission had a sudden change of plan in the mid-1950s and diesel locomotive types which were on order in small numbers for comparative trials were ordered in large numbers before the test locomotives had even been delivered. This change of plan was imposed on the horrified engineers. Whole fleets of the diesel locomotives were effectively prototypes and the engineers were saddled with the task of resolving the teething troubles. In the case of some of the classes, the teething troubles were never resolved and the expensive hardware - typically costing five times as much as the equivalent steam locomotives - went to the scrapyard even faster than the "Standards". Thus, all the planning that had been done to supersede steam traction in an orderly way was set aside and dieselisation was conducted in a rush. In France and West Germany, steam remained in use for another ten years or so. The article suggests that had economic considerations applied, the locomotives would have continued in service until the early 1990s, as intended. What the article does not mention in the article is that, as information has come to light both through research, release of documents and experience of the locomotives in preservation, they were exceptionally well-designed both overall and in detail, being almost free of inherent flaws. 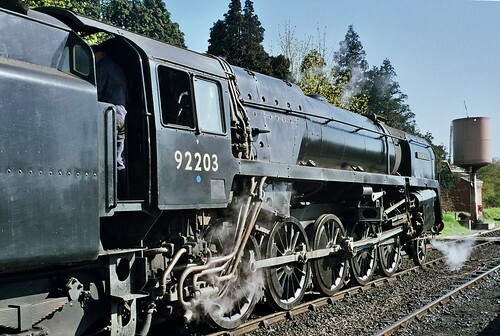 The 8P Duke of Gloucester and the 9F 2-10-0 were an outstandingly good designs. They would have had particularly long service lives. They would then have retro-fitted with the technical improvements developed by Porta, Wardale and Waller, that took place from the mid-1970. In that case they would probably still be in service on secondary routes currently operated by Sprinters and Pacers, as well as on infrastructure trains where long periods are spent doing nothing at all. In fact, it is not impossible that additional locomotives would have been built to replace the original standards as they wore out. That said, 12 different types was undoubtedly too many. Was there really a need for the 8P Duke, and the Britannia, and the Clan class and the class 5? Or for the class 3 tender and tank engines in-between the class 4 4-6-0 and 2-6-0 types, and 2-6-4 tank, and the class 2 2-6-0 tender locomotive and the 2-6-2 tank. It is good to see this deplorable series of events brought to attention. It is an excellent illustration of the expensive damage that can be done through political interference.